When we come to the vertebrates, the animals with backbones, the situation changes dramatically. We run smack into the most powerful evidence of evolution. At least that’s what I used to tell my students when I taught university biology as an evolutionist. Archaeopteryx has been the showcase for evolution. Found in 1860, the Berlin specimen is pictured in nearly all biology textbooks. 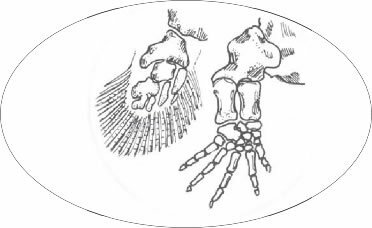 That specimen, along with a reconstruction in the same position, is shown in Figure 25. Figure 25. At last—evidence of evolution! . . . or is it? The famous Archaeopteryx combines features most often found in reptiles (teeth, claws, unfused vertebrae, and a long bony tail) with features distinctive of birds(wings, feathers, and a furcular or wishbone).Does Archaeopteryx provide clues as to how scales evolved into feathers, or legs into wings? Is Archaeopteryx more likely an evolutionary link, or a mosaic of complete traits (a distinctive created kind)? Read both sides and think about it. At first, you may wonder what the fuss is all about. It has feathers, wings, and a beak, so it’s a bird. But look closer. It has teeth in the bill, claws on the wings, no keel on the breast bone, an unfused backbone, and a long, bony tail. These are all characteristics we normally associate with reptiles. What’s more, the existence of a creature like Archaeopteryx was predicted by evolutionists before any such specimen was found! What’s a creationist going to say to a “perfect example of evolution” like Archaeopteryx? There’s no way I can get you to consider creation without facing up to Archaeopteryx. Well, first of all, the reptile-like features are not really as reptile-like as you might suppose. The familiar ostrich, for example, has claws on its wings that are even more “reptile-like” than those of Archaeopteryx. Several birds, such as the hoatzin, don’t have much of a keel. The penguin has unfused backbones and a bony tail. No living birds have socketed teeth, but some fossil birds do. Besides, some reptiles have teeth and some don’t, so presence or absence of teeth is not particularly important in distinguishing the two groups. 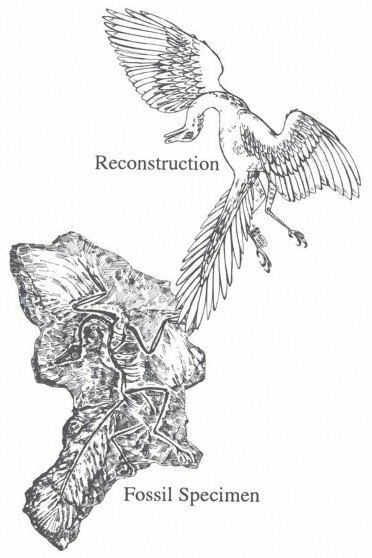 More importantly, take a look at the individual features of Archaeopteryx. Is there any clue as to how legs evolved into wings? No, none at all. When we find wings as fossils, we find completely developed, fully functional wings. That’s true of Archaeopteryx, and it’s also true of the flying insects, flying reptiles (pterodactyls), and the flying mammals (bats). Is there any clue in Archaeopteryx as to how reptilian scales evolved into feathers? No, none at all. When we find feathers as fossils, we find fully developed and functional feathers. Feathers are quite complex structures, with little hooks and eyelets for zippering and unzippering them. Archaeopteryx not only had complete and complex feathers, but feathers of several diﬀerent types, including the asymmetric feather characteristic of strong fliers. What about lack of a keel? Actually, muscles for the power stroke in flight attach to the wishbone or furcula, and Archaeopteryx had “an extremely robust furcula.” A growing number of evolutionists, perhaps a consensus, now believe that Archaeopteryx was a strong flier and the first bird, and not a missing link between reptiles and birds (see Carey1). Despite the demise of Archaeopteryx, evolutionists retain a deep-seated belief that someday a missing link between dinosaurs and birds will be found. As I write this, the evolutionist’s faith is focused on fossils from China, where large numbers of dinosaurs, dinosaur eggs, and some birds are found. With all the artistic (NOT scientific) skill for which National Geographic is famous, the public was treated to the picture of a baby “T. rex-bird” covered with down feathers like a newly hatched chick. Detailed art-work showed a close-up of the presumed “dinosaur feather.” In three months, over 100,000 young people saw the “proof” for dinosaur-bird evolution on display at National Geographic’s headquarters in Washington, D.C. It was all FAKE. The supposed fossil was fake. The art work and article in National Geographic described a fake. What influenced so many students touring the National Geographic exhibit in Washington was the display of a fake. Scientists with expert knowledge of birds, such as Storrs Olson at the prestigious Smithsonian Institute, also in Washington, D.C., recognized the scientific problems with National Geographic’s story almost immediately. In an open letter published in the Smithsonian magazine (dated November 1, 1999), Storrs Olson3 sternly rebuked National Geographic for (emphasis added) “. . . UNSUBSTANTIATED, SENSATIONALISTIC, TABLOID JOURNALISM . . . .”—putting the Geographic article in the same class as those about alien abductions and pigs that fly. His letter included details of many other examples of “scientific malpractice” in the National Geographic article. The fake was not particularly clever or subtle. Bolstering the myth that evolution is making scientific progress, a fawning and uncritical media often publicize flashy stories of exaggerated claims, only to publish an obscure retraction or “diﬀerent interpretation” a few weeks later. The National Geographic debacle should encourage scientific skepticism for several reasons. First, evolutionists are human beings, and all human beings make mistakes. Second, even if it’s given a scientific sounding name (like “Archaeoraptor”), a discovery announced in the news is not really scientific until other scientists have checked it out thoroughly. It only took a few weeks for scientists to disprove both Geographic’s claims about its “dinosaur-bird” and the news report that a NASA team had found fossils in Martian rock, but it took over 40 years to prove that “Piltdown Man” (“Eoanthropus dawsoni”) was a hoax, and Archaeopteryx has remained in textbooks long after it was scientifically discredited as a reptile-bird link. Although the Chinese fossils currently hyped are too high in the stratigraphic series, some evolutionists say the same form could one day be found in a lower layer. That’s true, but it’s an act of faith, not a fact of science! The whole search for missing links demonstrates that evolution is really a very strong faith-based belief system or world view, not a strictly scientific theory. An empirical scientist would survey fossil discoveries looking for patterns of order; an evolutionist begins with belief in Darwin’s belief, and then goes looking for the evidence to support that belief, evidence that Darwin said was missing. When I was an evolutionist, I hoped that I might one day become an “evolution hero” by finding a missing link. Fossil support for the evolutionist’s “tree of life” would require finding thousands upon thousands of missing links, and only a handful have even been proposed. (Problems are exposed in the evolutionist’s beliefs about the railroad worm, ammonites, fish-amphibian transitions, horses, and whales in books by Gish6, Parker,7 and Bliss, Parker, and Gish,8 and at icr.org and answersingenesis.org, and the platypus has already been discussed). No scientist building up a theory from the fossil evidence would ever come up with the concept of evolution guided by mutation-selection. Despite phenomenal fossil failure, faith in evolution remains unbounded. Evolutionists who admit that science has falsified the neo-Darwinian interpretation9 of evolution don’t usually turn to creation; they just propose diﬀerent kinds of evolution. A more serious post-neo-Darwinian theory did spark considerable scientific discussion. During the late 1970s and early 1980s, a group of evolutionists led by Harvard’s Stephen Gould tried to resurrect the idea that evolution happened in big jumps—“The Return of Hopeful Monsters” Gould called it.11 The hopeful-monster idea (variously expressed as punctuated equilibrium, saltatory evolution, or quantum speciation) was proposed to explain why the links required by gradual evolution have never been found.12 “Big jumpers” argued that mutations in embryonic regulator genes could eﬀect major changes in multiple systems simultaneously, but known examples produced only hopeless monstrosities (like four-winged flies that couldn’t fly), never hopeful monsters! Nor could “big jumpers” answer this crucial question about the first appearance of any hopeful-monster: with what would it mate? Figure 26. When they were known only from fossil remains, bones in the fins of the coelacanth were imagined to have joints at the wrist and elbow and to have a shoulder attachment strong enough for walking on land. Then the coelacanth was found alive and well, a fisherman’s favorite deep in the Indian Ocean, having fins without wrists or elbows, designed for swimming not walking. Once again evolutionists were forced to abandon a presumed “missing link” used for decades to “prove evolution.” The new evidence supported instead the creationist prediction that differences between fossil fish and amphibians would be like those between living members of these groups. At least the creationist and the post-neo-Darwinian punctuationalist agree that the missing links are missing. 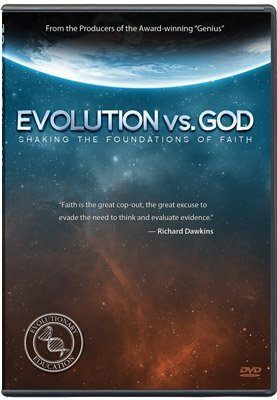 What is the scientific diﬀerence between saying that the missing links can never be found (the “new” evolution) and saying that they never existed at all (creation)? Sometimes it’s kind of fun to be a creationist. The “rear-guard” neo-Darwinian evolutionists like to point out the apparent absurdity of hopeful-monster evolution and claim that evolution could not happen fast. The punctuational evolutionists point to genetic limits and the fossil evidence to show that evolution did not happen slowly. The creationist simply agrees with both sides: Evolution couldn’t happen fast, and it didn’t happen slowly—because evolution can’t and didn’t happen at all! In terms of the kind of variation that can and did occur, the creation concept seems to be the far more logical inference from our observations. At least the hopeful monster concept avoids the problem of missing links. But notice: this alternate concept of evolution is based on the fossils we don’t find and on genetic mechanisms that have never been observed. 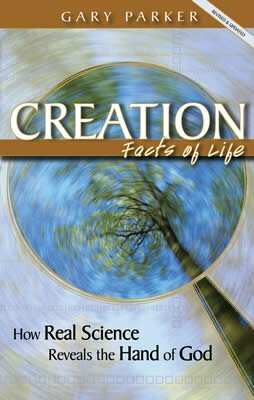 The case for creation is based on thousands of tons of fossils that we have found and on genetic mechanisms (variation within kind) that we do observe and see occurring every day. As a scientist, I prefer a model that’s based on what we do see and can explain (creation), rather than one that’s based on what we don’t see and cannot explain (evolution). Dr. Parker, a leading creation scientist and former AiG speaker, presents the classic arguments for evolution used in public schools, universities, and the media, and refutes them in an entertaining and easy-to-read style. A must for students and teachers alike! This is a great book to give to a non-Christian as a witnessing tool. Bjorn Carey, “Early Bird,” Discover (April 2006): p. 15. C.P. Sloan, “Feathers for T. rex,” National Geographic (November 1999). Storrs Olson, open letter, Smithsonian (November 1999). Tim Friend, “The ‘Missing Link’ That Wasn’t,” USA Today (Feb. 1, 2000). 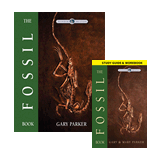 Parker and Parker, The Fossil Book. Duane T. Gish, Evolution: The Fossils Still Say No! (Green Forest, AR: Master Books, 1995). Bliss, Parker, and Gish, Fossils: Key to the Present. David Raup, “The Revolution in Evolution” World Book Science Year 1980. M.A. Norell, E.S. Gaﬀney, and L. Dingus, Discovering Dinosaurs in the American Museum of Natural History (New York: Knopf, 1995). Stephen Jay Gould, “The Return of Hopeful Monsters,” Natural History (June/July 1977). Stephen Jay Gould, “Is a New and General Theory of Evolution Emerging?” Paleobiology (Winter 1980).